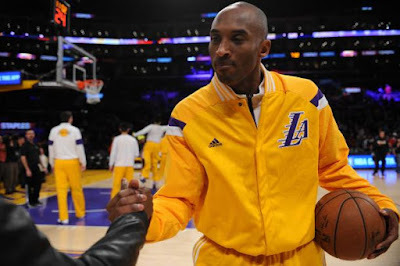 Los Angeles Lakers star shooting guard Kobe Bryant did a Q&A with Yahoo! Sports recently, and he was asked a variety of question. Bryant enters the 2015-16 NBA season with a young, up-and-coming Lakers squad featuring solid pieces like Julius Randle, D'Angelo Russell, Jordan Clarkson and more. It definitely isn't probable the Lakers make the playoffs, but it is possible. Bryant was asked about the Lakers' playoff chances saying, "Of course it can. Absolutely. We have talented players in their respective positions. We have some really young players. How exactly will the pieces of the puzzle fit? We really don’t know. We are going to [training] camp trying to piece this together just like every other team does. We have to figure out what our strengths are, figure out what our weaknesses are. And every time we step on the court we are going to try to hide our weaknesses and step up to our strengths." Bryant was also asked about the possibility of playing small forward in the starting lineup this season. Bryant has played shooting guard most of his career.